If you're a devoted reader of my blog, which I sincerely hope that you are not, and that you have better things to do with your time, you will notice that this post is part of my earlier post on Professor Pat Lakin-Thomas' VLOG on the Biology Department's Research Practicum course. In the summer of 2017, I began a large, group project with nine research practicum students to get on top of my out-of-control academic clutter. We had great fun doing collaborative team work, in which the research protocol was co-created with the students. 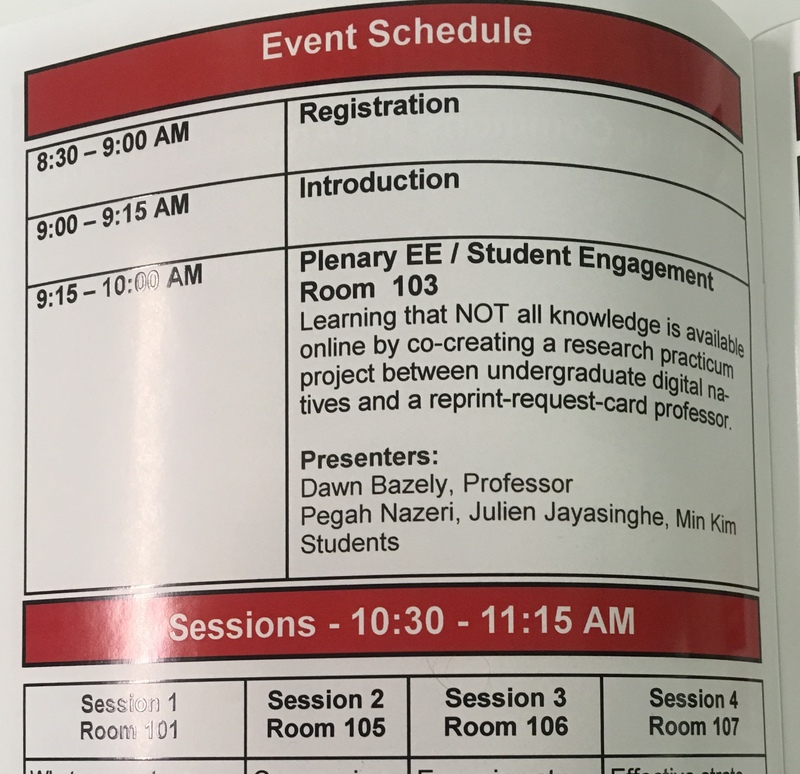 During the summer, I realized that our project aims and activities were widely applicable to all professors in all subject areas across York University. I brainstormed some semester-end treats for the students, like visiting the York University archives to see the treasures that the university possesses. I also proposed writing-up our project and presenting it as a student experience project at the 2018 Teaching in Focus conference. In September 2017, myself and two of the research practicum students, Pegah Nazeri and Julien Jayasinghe, who had emerged as team leaders over the summer, met with Prof. Celia Popovic. Celia was, until December 2018, director of the Teaching Commons. We asked her if we could co-present our summer 2017 Research Practicum project as a talk, at the annual May 2018 conference. We were thrilled when Celia was very taken with our Academic Decluttering project, telling us that it fit well with the conference theme of Student Engagement. She told us that our project could be suitable for a plenary talk! We were pumped. I learned while I was on sabbatical as a visiting professor in India and Australia, that the conference had, unfortunately, needed to be canceled, due to this year's CUPE strike. So, we were delighted to hear that it was being rescheduled for December 2018. In Fall 2018, Min Kim undertook an independent study course to review the research literature pertaining to our academic decluttering project which had looked at which of my many hard copy reprints and photocopies were available digitally through the library. I invited members of the group of nine original research practicum students from the summer of 2017, who were all listed as co-authors on the abstract, to participate in developing the talk, but in the end, Pegah, Julien and Min were the main contributors to the talk. Having an extra six months to work on our talk allowed us to improve it immensely! This is how three Biology undergraduate students, the two who led the research practicum team work, and the student who reviewed the research literature, came to be co-presenters of the Keynote Plenary at the rescheduled 2018 Teaching in Focus conference. 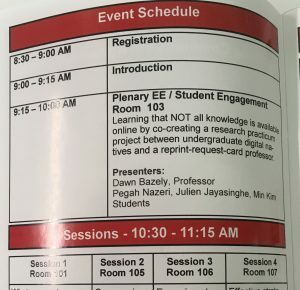 Recently, as we were finalizing our talk, I realized that undergraduate students, who haven't attended many academic conferences were unfamiliar with terms like plenaryand keynote talks. This revealed yet another aspect of students learning how science and academia works, this time, with respect to conference organization and structure. Here is our final talk: Not Everything is Digitized!